This post is part of the #20in13 series. For more, or to participate... check out this post. Feeling #1: Whew. Though many women do it, bringing a baby into this world is scary. With my first, I was scared because I didn't know what to expect. With my second I started to cry as we walked into the hospital, because I knew I wasn't coming out until it was over and for some reason that freaked me out. So when they both finally arrived I was relieved. Feeling #2: Is he okay? 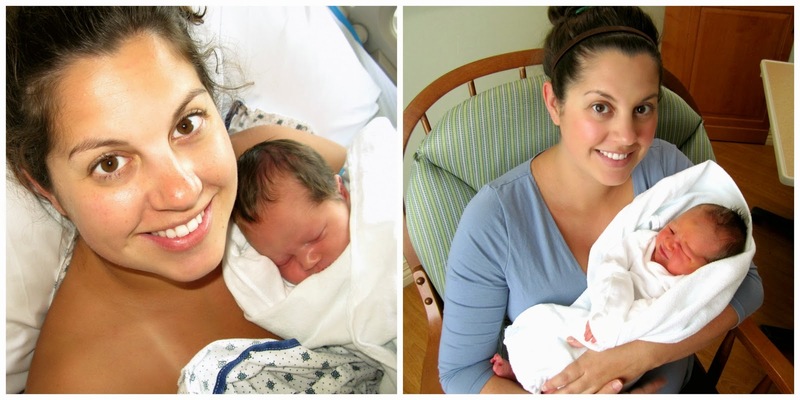 I had relatively normal pregnancies. And even though every test and ultrasound looked fine, I'm sure I'm just like every other woman: I worried. Would he be healthy? Would he be a boy? (I didn't completely trust William's ultrasound tech-- because I couldn't clearly see what he was saying we were looking at...) When Henry arrived one of the first things I asked Mark was "does he have ten fingers and ten toes?" Mark's response: "Yes, and two balls!" You can see we were worried about different things. Feeling #3: Oh my gosh, I'm giving birth to an octopus. This may be too much information, but when Henry arrived into this world, I literally thought I was giving birth to an octopus. It was a lot slimier feeling than expected. And it felt like he had way more that two arms and two legs. I wondered if it would be the same when I pushed William out. The answer: Yes. Feeling #4: I did it. I was proud of myself for bringing my babies into this world. And with William I did so, by choice, naturally. Which was unbelievably amazing! Feeling #5: That wasn't so bad. I'm sure part of this is the crazy number of hormones racing through my body at the time, but giving birth wasn't as hard as I thought it would be. Don't confuse this with it being easy. It's not easy. But I wouldn't describe my delivery as terribly painful-- even with William without an epidural! I am very fortunate to have had two relatively easy births, so many other women might not feel this way. With Henry I remember Mark looking very, very concerned when I'd glance at him in between pushes. I wanted to tell him, "Don't worry babe, it's not that bad." But I didn't because I didn't want the nurses to think I wasn't trying. The next morning, I was worried about how bad I probably looked, so I finally glanced in the mirror. My first thought? Oh, I don't look so bad. I've had hangovers worse than this. Feeling #6: Is it already over? William came very, very quickly. I literally had one practice push, followed by a long contraction that was 2-3 big pushes and he was out. We're talking minutes. With Henry, I seriously enjoyed the pushing part, so I was looking forward to it with William. I know this sounds weird. But it's true. I felt so focused, and in tune with my body. So when William arrived so quickly I was a little disappointed that the experience was so short. It was over before I knew it began. The doctor kept asking me if I was sure I was okay afterwards. I was just in shock. Are they allowed to come that fast? I asked. There aren't really any rules, he told me. Feeling #7: Oh my gosh I love you. This needs no explanation. Feeling #8: He looks so good as a daddy. There's nothing like looking over at your husband while he's watching over your child that's only minutes old. With Henry, it was so interesting to me, because I had never seen that sort of pride in him before. With William, he was a proud daddy all over again. Is there anything more attractive than a brand new, proud dad? Answer: No. Feeling #9: You're a whole new person. You know you're having a baby. But it doesn't really hit you until you see that tiny face, and hold that tiny hand: there's a whole new person in this world who wasn't here a second ago. Feeling #10: Who will you be, little one? I was struck by an intense curiosity the first time I met both of my children face to face. When they are so little, you literally have no idea who they are aside from this little swollen, pink baby. Who will they grow to be? In those first moments, you sort of wish you could get a peek at them as an adult, just for a second. But let's face it... that would ruin the adventure. My two little adventures of a lifetime. Love this! Definitely agree on a lot of the same things...especially the second birth going too fast! Though Eli could have been much less and much easier, but Isaac made up for all of that! I almost wish I could do it over so I could take in a little more!